The face of American TV evangelist Pat Robertson has revealed publicly for the first time that it is the victim of a pact made by its owner, Pat Robertson, with the devil. “Something happened a long time ago in Virginia, and people might not want to talk about it,” said Pat Robertson's face whilst its owner was recovering from ingesting his own weight-loss shake made from the blood of living goats. “Religion on television was under the heel of the , uh, you know, considered and learned people, so Pat swore a pact to the devil, true story. And so the devil said, 'OK, it's a deal.' And Pat was able to form The Christian Broadcasting Network, but ever since I have been cursed and disfigured by the hate I, as his face, have to channel for Pat Robertson. 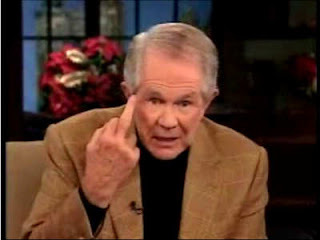 The face of Pat Robertson went on to link other aspects of the life of Pat Robertson that others, less enlightened than his face would put down to being completely unrelated.